Computex 2017 just closed on June 2, with the biggest brands present at the huge event in Taipei, Taiwan the week of May 28. It’s arguably the most important show of the year for the desktop, laptop and components you’ll want to buy. 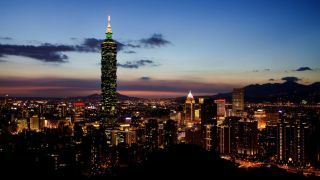 From huge news to simply cool findings, here’s everything you might have missed from the biggest computing companies in Taipei from May 30 through June 2. We couldn’t build rigs like this if we tried. For the true gaming PC enthusiasts and gawkers alike, a huge draw of Computex is no doubt the legions of custom gaming PC case modifications, or “mods” that descended upon the show floor this year. Like a PC would just be a pile of parts without a case, Computex wouldn’t be complete without some stand out PC chassis designs. Luckily, several manufacturers delivered the goods with plenty of concepts, newly finalized designs and a few surprise callbacks to legendary computer chassis from the past. Because some serious gaming PCs and laptops weren't enough, MSI unveiled a line of new gaming gear to accompany those devices, set to launch in sometime this month. The line includes the Vigor GK80 mechanical keyboard, Clutch GM70 mouse and the Immerse GH70 gaming headset. The components sport a spectacular design with a mandatory RGB LED backlighting system. Have you been mulling an external GPU for your notebook? But perhaps you’re put off by the cost of the things, or their bulkiness, or proprietary nature in some cases? Then the new Aorus GTX 1070 Gaming Box might be just the ticket, providing a more affordable external graphics solution which is very compact, not to mention compatible with any notebook that has a Thunderbolt 3 port. We got to spend hands-on time with the Acer Spin 1, which is priced like a budget laptop, but certainly not built like one. It benefits from an all-metal chassis, among other boons such as a Full HD screen, at a very tempting price point. Indeed, we described the value-for-money inherent here as ‘absolutely bonkers’, no less. What can Computex tell us about life after Moore’s Law? One of the highlights of Computex was witnessing Nvidia CEO Jensen Huang talk about life after Moore's Law – the dwindling of which theoretically threatens to slow the march of technological progress. We’ve got an in-depth opinion piece right here that examines how manufacturers are improving their devices at Computex this year, continuing to innovate despite the death of Moore's Law. And we discuss how Nvidia is combating this reality, with a focus on making machines smarter rather than simply more powerful. Logitech has announced long-awaited updates for two of its best wireless mice with the MX Master 2S and MX Anywhere 2S. Not only do the new peripherals add longer longer battery life and greater tracking accuracy, they come with a new piece of multi-desktop and multi-platform navigation software. While AMD has plenty to say of Ryzen this week during Computex, the firm remains tight-lipped on its AMD Vega graphics architecture. Further to the point, AMD made a point during its announcements to say that new Vega graphics cards would not be shown until this year's SIGGRAPH conference at the end of July. So, it seems we likely won't see the new Vega graphics cards on store shelves until this August at the earliest. Hold on just a little – OK, a lotta' – bit longer, folks. Another big revelation was the first Ryzen-powered gaming laptop from Asus. The ROG Strix GL702ZC will run with a Ryzen 7 octo-core processor and a full discrete AMD Radeon RX 580 GPU, offering plenty of power under the hood. AMD also talked about its plans for Ryzen mobile APUs. Microsoft and Qualcomm revealed more about their joint plans for mobile PCs powered by Snapdragon SoCs, with devices to be produced by Asus, HP and Lenovo. These will be thin-and-light fanless notebooks which run the full version of Windows 10. We also chatted with Qualcomm’s VP of global product marketing, Don McGuire, who believes that the Snapdragon 835 will cause a fundamental shift in the way we use our PCs. Following Intel’s big Core i9 revelations seen earlier at Computex, AMD wasn’t to be outdone, taking to the stage to share some details of its Ryzen 9 Threadripper CPUs – which will be headed by a flagship monster 16-core (32-thread) processor. This 35-inch beast has a 21:9 aspect ratio with an Ultrawide QHD resolution (3440 x 1440) and a super-impressive 200Hz refresh rate. Along with G-Sync, HDR and Quantum dot technology, this is sure to dazzle. The upcoming Republic of Gaming Swift PG35VQ monitor from Asus may be arriving as early as Q4 of 2017, so keep your eyes peeled (although we doubt it'll slip by unnoticed). Meet the Samsung Notebook 9 Pro, a 2-in-1 version of its Notebook 9 available in both 13 and 15-inch models that come packed with the firm's famed mobile S-Pen stylus. Just like on its Galaxy Book, the S-Pen here does not need to be charged, bringing painless pen input to two new screen sizes of Samsung's. Looking to build a rig with record ratios of performance per square inch? Then you're gonna want to look into Zotac's new Nvidia GeForce GTX 1080 Ti Mini, the smallest version of the GPU yet. Launching in standard and liquid-cooled versions, both cards measure 9 inches long and feature snazzy "Spectra" lighting for as yet undisclosed prices. The firm also announced a new gaming brand with slim form factor "Meka" PCs. With Nvidia's Max-Q laptop chip design in tow, this Asus gaming laptop brings GTX 1080 power to a laptop the size of a 15-inch MacBook Pro. The Active Aerodynamic System, which drops down part of the laptop’s underside to raise the machine at a slight angle and reveal an exhaust vent, is a key innovation making this possible. What's more, we've got a hands on Asus ROG Zephyrus review. Cooler Master has revealed a host of peripherals over at Computex, including a new flagship mechanical keyboard, alongside a pair of mice, a keyboard and mouse set, gaming headset, and fresh PC cases. The flagship keyboard has its own processor and memory allowing for some neat tricks, and there’s plentiful RGB lighting on-board. MSI is having a busy time at the show, having revealed a load more laptops. These include the latest ‘Raider’ gaming laptops, the GE63VR and GE73VR, which boast a 120Hz display that’s basically a gamer’s dream-screen. The company has also sneaked in new Stealth Pro gaming notebooks packing the same tasty displays, and also benefiting from Nvidia’s innovative new Max-Q technology, which was unveiled earlier at Computex. Now, we've got our hands-on MSI GT75VR Titan review to give an idea of where the firm is headed next in its big-and-bad lines of laptops. Intel's keynote on Tuesday touched on a number of subjects, including smart cities and the future of computing. However, it was the launch of its new line of Intel Core-X processors, including the incredible 18-core i9 CPU that really got us excited. Nvidia's keynote highlighted the launch of its Max-Q technology. This exciting new tech will make gaming PCs more powerful, as well as lighter and slimmer. Since then, we've seen gaming laptop vendors like Acer, Asus, Gigabyte and MSI announce their first devices making use of the technology. We took Acer’s Predator Triton 700 ultra-thin gaming notebook for a hands-on spin. It’s a pricey behemoth of a machine, but can this notebook’s svelte nature, mechanical keyboard and nifty cooling system justify the price tag? Dell has spoilt us with three brand new, all-AMD desktop PCs. Specifically, an Inspiron all-in-one PC has been shown in both 24- and- 27-inch varieties, as well as a new gaming desktop in disguise. Dell also took the Computex stage as the opportunity to unveil its first-ever Inspiron gaming desktop, designed to bring near-boutique gaming PC quality to buyers for far less than the real deal. We'll have hands on reviews of these machines soon. Gigabyte has given us a closer look at its Aorus gaming laptops at Computex 2017, with the Aorus X9, Aorus X5 MD and Aorus X7 DT all putting in an appearance. Gigabyte also gave us global launch-dates for all its upcoming gaming laptops. MSI showed off its new monster of a gaming laptop, the GT75VR Titan, which benefits from an innovative low-profile mechanical keyboard and some top-notch hardware including a beefy Core i7 CPU (which can be overclocked to 4GHz) plus options on SLI graphics cards. Corsair introduced a new mechanical keyboard, the K68, which is a hardy peripheral designed to withstand the likes of drink spills, being water and dust-resistant. Asus claims that the ZenBook Flip S is the thinnest convertible laptop in the world, and it won’t break the bank either. We’ve been having a play with this 2-in-1 at Computex: can it deliver without making too many compromises? Thin but powerful? It’s a winning combination, and one that the Asus ZenBook Pro seemingly nails with flair. Check out our full hands-on with this laptop which has the potential to be a smash hit for a number of reasons.